The Longines Saint-Imier Collection has been inspired by the foundations of the watchmaking tradition on which the brand, known by its winged hourglass trademark, has been built. Longines was set up in 1832 in what was then a small village nestling in a valley deep in the Swiss Jura mountains: Saint-Imier. Right from the firm’s early days, Longines Watch Co. Francillon Ltd. has played a central role in life in Saint-Imier, which has since become a watchmaking hub. The fate of Longines and the village of Saint-Imier has thus been closely interwoven. This long relationship has now been sealed by a collection of exceptional timepieces all fitted with mechanical movements: The Longines Saint-Imier Collection. The shape of the case – inspired by a model dating from 1945 – is a common theme throughout the collection. The sleek lines and the distinctive lugs provide these new models with a subtle balance between classical and contemporary design. 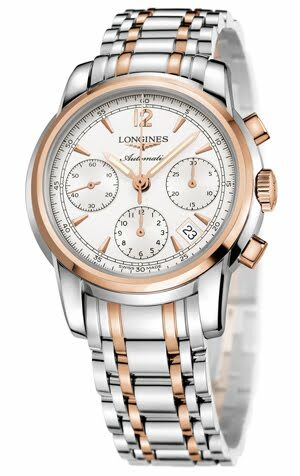 The Longines Saint-Imier Collection includes watches that show the hours, minutes, seconds and date, and chronographs, plus a prestige model featuring four retrograde functions as well as a day/night display and phases of the moon. All the models in this collection are fitted with mechanical movements whose intricate workings can be admired through the transparent sapphire back cover. The versions that show the hours, minutes and seconds with a date aperture at 3 o’clock are available in steel, in steel and rose gold or in rose gold. With a choice of four case sizes (26 mm, 30 mm, 38.50 mm and 41 mm), including some set with diamonds all our customers will find a version that fits snugly on their wrist. The choice of dials includes black, silvered or white mother-of-pearl with diamonds index and, thanks to the Super-LumiNova coating on the hands, reading the time is never a problem. The watches in this collection are fitted on a black or brown alligator strap, or a steel or steel and rose gold bracelet, with a folding safety clasp, to match the dial. The chronographs are fitted with an L688.2 column-wheel movement specially developed and produced by ETA exclusively for Longines. The case is made of steel, steel and rose gold or, for certain models, rose gold alone, and is available in two diameter sizes: 39 mm and 41 mm. The silvered or black dial shows the hours and minutes and has a small seconds at 9 o’clock and a date aperture as well as the chronograph functions: a centre sweep seconds, a 30-minute counter at 3 o’clock and a 12-hour counter at 6 o’clock. These chronographs are fitted on a black or brown alligator strap or on a steel or steel and rose gold bracelet, all having a folding safety clasp. Finally, a prestige model embodies the quintessence of Longines’ watchmaking know-how. This timepiece, with a diameter of 44 mm, houses calibre L707, specially developed and produced by ETA exclusively for Longines. There is a choice of a black or silvered dial featuring 12 Arabic numerals and showing four retrograde functions (day of the week at 12 o’clock, date on the right-hand side of the dial, second time-zone with a 24-hour scale on the left-hand side of the dial and a small seconds at 6 o’clock) as well as day/night and the phases of the moon. These exclusive models are mounted on a black or brown alligator strap, or a steel bracelet to match the rest of the design, all with a folding safety clasp. Longines has been based at Saint-Imier, Switzerland, since 1832. It is celebrating 180 years of non-stop craftsmanship in 2012 and its watchmaking expertise reflects a strong devotion to tradition, elegance and performance. It has generations of experience as the official timekeeper at world championships and as a partner of international sports federations. Over the years, the brand has built strong and long-lasting links with the equestrian sports. Longines is a member of The Swatch Group S.A., the world’s leading manufacturer of horological products. With an excellent reputation for creating refined timepieces, the brand, whose emblem is the winged hourglass, has outlets in over 130 countries.